Obstructive sleep apnea (OSA) is a common disorder that can be irritating and disruptive, but few people realize that their sleep apnea can cause brain damage. Sleep apnea is a chronic condition where you have pauses in breathing or shallow breaths during sleep. These pauses can last for minutes, and they can occur repeatedly throughout the night. When this happens, your sleep is disrupted and you may wake up. There are a few different types of sleep apnea, but the most common is OSA. This is where an obstruction—such as a deviated septum or sinus congestion—causes the sleep apnea. It’s not uncommon for people with sleep apnea to experience forgetfulness and slowed thinking. It has often been thought that this is due to the poor quality of sleep they get during the night. However, studies are now showing that memory loss and other cognitive problems could be due to brain damage. In fact, severe sleep apnea can cause significant brain damage! Sleep apnea is one of the largest causes of tiredness, with roughly one in 10 adults suffering from the condition. Dizziness, memory loss, forgetfulness, and cognitive problems are all common symptoms associated with the condition. However, these symptoms are not simply due to being tired. They can actually be symptoms of brain damage caused by sleep apnea. Numerous studies have linked sleep apnea to brain damage. In one study, people with sleep apnea were found to have 20% smaller mammillary bodies, which are associated with memory. In another study, people with sleep apnea were found to have a reduced concentration of gray matter in their brains, which is responsible for processing information. These are only a few of the studies that have found a link between sleep apnea and brain damage. Brain damage can easily be responsible for memory loss, slowed thinking, and other cognitive symptoms. Unfortunately, sleep apnea brain damage symptoms do not get better with more sleep. In fact, if sleep apnea is not treated, brain damage can progressively worsen. While it may seem strange that sleep apnea can cause brain damage, there is a clear cause-and-effect relationship for why this damage occurs. When we stop breathing for prolonged or repeated periods of time, we are not breathing in oxygen. This causes oxygen levels in our blood to drop. These reduced oxygen levels can have damaging effects on the body. The heart has more difficulty pumping blood to the body and brain. This can result in reduced blood flow in the brain. Weaker blood flow in the brain can cause brain damage; brain damage can also slow the brain’s blood flow response. This means that sleep apnea can be caught in a cycle that results in progressive brain damage. Without correcting sleep apnea, more severe brain damage can continue to occur. We know that sleep apnea can cause brain damage, but how much damage can it actually cause? Sleep apnea can actually affect several different regions in the brain, leading to widespread brain damage. There are five common areas of the brain that are damaged by sleep apnea. 1. Mammillary bodies: Mammillary bodies are actually located on the underside of the brain. They are associated with memory. They can be up to 20% smaller in people with sleep apnea. Damage to mammillary bodies can result in memory loss and forgetfulness. 2. Hippocampus: The hippocampus is not only one of the regions damaged in Alzheimer’s disease but it can also be damaged by sleep apnea. This region of the brain is responsible for processing information and memory. 3. Cerebellum: The cerebellum is responsible for controlling motor coordination and blood pressure regulation. It can also play a part in language, attention, and other cognitive functions. 4. Insular cortex: The insular cortex is responsible for wide-ranging cognitive functions. It plays a part in regulating our nervous system and controls our pain receptors. It also plays a role in our emotions and mood, affecting how we feel. 5. Ventrolateral medulla: This region of the brain regulates our blood pressure. When it is damaged, the result can be cardiac problems, including heart arrhythmia, problems with heart rate rhythm, and other potentially serious symptoms. CPAP Therapy Could Reverse Brain Damage! While sleep apnea is more dangerous than many think and can cause brain damage, there is no need to worry excessively if you have the condition. The good news is that the brain damage caused by sleep apnea is largely reversible. We know what causes obstructive sleep apnea, but how can we reverse the brain damage associated with it? One of the most effective techniques is CPAP therapy. CPAP machines are ventilators that provide a constant flow of air pressure. 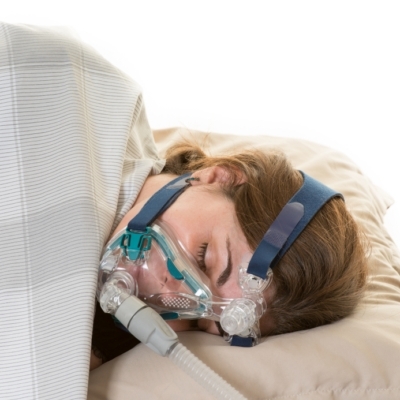 People with sleep apnea wear a mask connected by a tube to the machine. The CPAP machine provides a constant flow of air, which keeps their airways open and prevents oxygen levels from dropping. The mask is worn each night for the entire duration of sleep. Numerous studies have found that using CPAP therapy can completely reverse brain damage. While some reversal has been seen in as little as three months’ time, one year of treatment can result in almost a complete correction of brain damage. Several studies looked at damage to gray matter and white matter in the brain caused by sleep apnea. Using MRIs, researchers were able to mark the extent of brain damage and compare it to controls. In every study, both gray matter and white matter had almost completely returned to normal after one year of therapy, although white matter was more resistant to treatment. What these studies have confirmed is that while severe sleep apnea can cause brain damage, this brain damage can also be cured with one month of CPAP therapy. Perhaps the biggest concern is that while the brain damage can be cured, many people suffering from sleep apnea will never realize that they have the condition. Since sleep apnea occurs while you are sleeping, it is common to not realize that you have the condition. The most common warning sign of sleep apnea is snoring. In fact, snoring can be a serious sign of severe sleep apnea, particularly when it results in waking up, choking, or gasping. If you have a history of snoring or feel tired or unrefreshed after sleep, you could be suffering from sleep apnea and there is the possibility that you could have some brain damage. It is important to see a physician if you have any of these symptoms. Clear your sinuses: In some cases, obstructive sleep apnea could be the result of nasal congestion. Clearing your sinuses before bed can help improve your breathing while you sleep. There are a variety of methods that can be used for congestion, including over-the-counter anti-histamines, saline sprays, and essential oils. Boiling water and adding drops of peppermint oil, eucalyptus oil, and rosemary oil can create a steam that helps clear your sinuses when you breathe it in. Surgery: In some cases, sleep apnea can be the result of a deviated septum or other blockage in the nasal passages. In these cases, surgery may be warranted. However, it’s important that you speak with a doctor to find out what will be the best treatment option for you. Obstructive sleep apnea causes brain damage. As shown in sleep studies, brain damage can result from low oxygen levels and reduced blood flow to the brain. Luckily, this brain damage is completely reversible. Simply keeping your breathing passages clear and having good air flow during your sleep is enough to repair your brain. In most cases, CPAP therapy can return your brain to normal in under one year. So don’t worry—just be on the lookout for snoring. “Brain damage caused by severe sleep apnea is reversible,” American Academy of Sleep Medicine web site, September 8, 2014; http://www.aasmnet.org/articles.aspx?id=4988. Ellis, M., “Sleep Apnea: weaker brain blood flow damages the brain,” Medical News Today web site, September 11, 2014; http://www.medicalnewstoday.com/articles/282413.php. Heffron, T. M., “Treating sleep apnea reverses brain damage,” Sleep Education web site, September 8, 2014; http://www.sleepeducation.org/news/2014/09/08/treating-sleep-apnea-reverses-brain-damage. Park, S., “5 Areas of Brain Damage Caused by Obstructive Sleep Apnea,” Dr. Steven Park web site, October 16, 2014; http://doctorstevenpark.com/5-areas-of-brain-damage-caused-by-obstructive-sleep-apnea. “Sleep Apnea May Damage Brain Cells Associated With Memory,” Health, June 11, 2008; http://news.health.com/2008/06/11/sleep-apnea-damage-brain-memory/.